I’m worn out, Dan. That was a thorough tour. It’s completely maddening and I agree with you 100%. Thank you for taking the time to write this up. It was extremely well done. I look forward to sharing your article with my friends. Thanks, Neece. It was, at times, painful to write it, but I wanted to get it out there. I still have some more information to write up about some of the presentations and videos that we saw while we were there, but this part was about the main museum “tour,” so to speak. It’s a crazy, crazy place. You could probably start a blog, just on this subject, and only pointing out the errors. You could probably carry on, on this subject alone, for about a year, IF you were blogging every day!! It would last just about as long as the Flood! How … cosmic! Fascinating series. The high production value shows that they’re definitely not lacking for resources, even though the “content” can be easily refuted, as shown. Thanks for posting this so that we skeptics know what we’re up against! The high production values even carried over into their food venues. Craig and I both had seriously kickass sandwiches there, but the $20+ admission fee makes it an expensive lunch. With production values that high, I can’t help but wonder about the amount of money that went into it. How much following of the words in their bible…supposedly from the founder…could have been done with that amount? How many homeless could have been housed? How many hungry could have been fed? How many naked clothed? How many sick healed? I would more respect an institution that would consider that as one of their guiding tenets than these who prefer to feed dogma to the masses. Absolutely, Judith! I’ve read that it was about a twenty-seven million dollar project. That would fund a LOT of shelters and soup kitchens for a long time. My brother-in-law, who is a Christian in Kentucky, is extremely embarrassed by this museum. He wondered exactly the same thing. How many people could have been fed and clothed (or provided health care) for the amount of money that was spent on this. So, they are following Jesus’ teachings very nicely. What a selfish git he turned out to be! My parents were fundamentalists. We LOVED Ken Ham, Dr. Dobson, etc, etc. We went to every fundie conference we could afford. 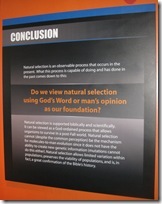 My parents went to the Creation Museum last year sometime. Hooray! That’s great to hear. I assume your parents are still fundamentalist? …at least were last year. My parents walked out on the church before I was born; and he was a Church of Christ preacher!!! As much as I think the internet (which I use freely) and TV (which I leave on constantly) are examples of modern societies ills, they have a purpose. Anyone, especially children, who become curious can access all of the information they want on any topic. There is no hidden nest anymore in which the CReotards can sequester their youth. These societal pacifiers are the prime reason, in my opinion, for the increasing acceptance for evolution. Ditto to Laura. I was a YECer, went to every Ken Ham speech nearby… Even volunteered for our local creationist organization. Unfortunately, though I’ve seen through the lies, I’m afraid my younger sister is actually a missionary in Africa right now. She’s a fully registered nurse working in their hospital in the bush, but, in true Christian spirit, she’s made it abundantly clear that helping heal their bodies is only an excuse to preach at them. My dad’s “promise keeper” group is even doing a YEC course. I volunteered to speak at their meeting to explain what had changed my mind… It didn’t go so well. I’d never seen so many grown men spouting such willful ignorance… I left very depressed, but I hope at least some of what I said might bother them enough to go look it up themselves instead of having their science spoonfed to them after being mushed up by the bible. Thank you for sharing this, painful as it must have been. I’ve been seriously curious about the museum but couldn’t bear to give them money for an actual visit and now I feel like my curiosity is satiated. 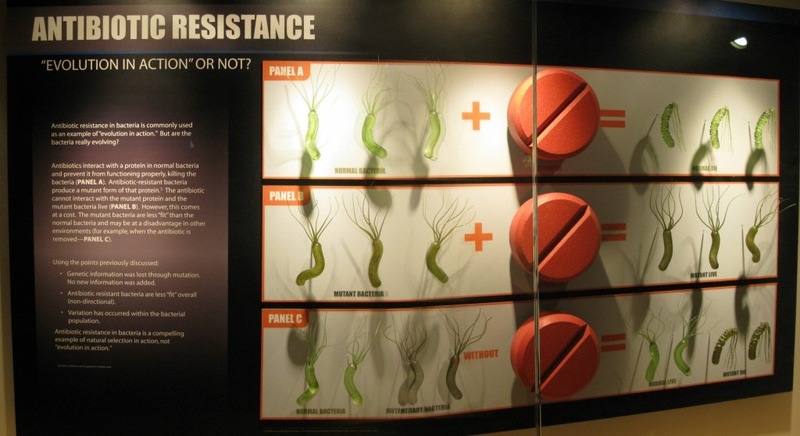 My only hope is that some kids with brains see the contradictions between the various plaques and exhibits and it makes them start asking the big questions. It was the contradictions in the bible that pushed me out of Catholicism and, even at a very young age, I know I would have been quite perplexed at how to reconcile all these different “facts” into any form of consistent philosophy, no matter how much dogma I’d been fed. In fact, I feel like they are doing a great job of proving themselves deadly wrong. Very sad that people could be sucked in by a place that makes such a mockery of the very argument it is trying to make. Sheep herders? I think we should respect other cultures and not blindly mischaracterize them any more than we should blindly mischaracterize evolution as if some saw it as the equivalent of natural selection. There were probably a couple of Old Testament/Torah authors who were sheep herders. Most were not. But referring to them as such is just dismissive, without recognizing the value of their ideas. We don’t go to the Bible to get our science, but neither should we assume that because some ancient guy didn’t have a university education and worked in the fields all day, he had nothing to offer. Yes, “sheep herders” is dismissive and another choice of words would perhaps be more politically correct, but much in the bible warrants dismissiveness, specifically when interpreted the way the Creation Museum interprets it. Perhaps “non-scientific, tribal people” would be closer to accurate. I certainly did not mean to imply that those lacking a university education have nothing to offer. Far from it. However, if an uneducated person who spends his life working in the fields tries to tell me that the facts show that the sun revolves around the earth, or that dinosaurs hung out with humans, or that eight people survived a global flood in a boat loaded with animals, or that humans were magically created, or that dead, rotting bodies come back to life… then I think he can be summarily dismissed. If he, on the other hand, tells me that this world is gorgeous, or that the stars can be emotionally soothing when viewed on a clear night, or that sowing seeds in a certain way makes them grow stronger, or that certain types of soil are superior for corn, or that plowing the earth makes him feel like he’s fulfilling a great purpose in his life, or a myriad of other things… then his views and opinions are incredibly worthwhile. My ancestors were sheep herders (and cattle herders, and fishermen). It’s nothing to be ashamed of. The point is they weren’t 21st Century scientists, and no rational person would expect them to be. I got all the way to part 6 and had to stop… I just could not take the stupidity anymore, it burned! I don’t think sheep herders is far off, since the societies where these works were written were all essentially agrarian (think how many Americans lived on farms at the turn of the 20th century, only more so). However “sheep herders” doesn’t accurately capture why we can afford to be dismissive, since there’s nothing wrong per se with herding sheep, and actual sheep herders were illiterate. I think it makes sense to call the writers of scripture, simply, backward. They were the most sophisticated members of their society, but that society was one with rudimentary civic institutions, morals, laws, justice, politics etc. etc. Almost certainly organization was tribal more than centralized, and information was largely transmitted orally, with the opinions of the powerful being definitive. Think the back blocks of Afghanistan. In fact, think somewhere that makes Afghanistan look like Manhattan. Thank you so much for giving us this look at the *Museum. * I would not have been able to complete the tour, I think. It is sorrowing and maddening at the same time, to me, that this place and what it represents exists, but such is life among humans. I do hope this species manages to hang on long enough that some day rational thought becomes the majority viewpoint. I don’t look for it anytime soon. I’m another of those who started out in a Christian family, then over time and much “seeking” morphed into an Atheist through observation, questions, and education. You have provided us with an excellent report, Dan. I accessed it through Panda’s Thumb. Thanks, Jan. You’re welcome. It was painful at times, humorous at others, and sad at still others. More often than not, those emotions were mixed with frustration and disgust when we were touring the museum. Wow, the creation museum has more aesthetic value than our local art museum! Looks like a lot of effort was put into making those exhibits! What is this mix of awe, respect, pity, and sadness I’m feeling? I guess it’s the same feeling you describe throughout your tour. Dan – kudos on this series. I doubt that I could even fork over the entrance fee for this monstrosity, never mind actually make it through the entire exhibit. This willful embrace of ignorance is totally inexplicable to me, and both frightful and sad. I also marvel at the irony of a group that denigrates real science yet feels the need to validate their belief by invoking fake “science”. Sigh. It’s a scary place, that museum. My only question is how did you keep your head from exploding? Heh. Seriously, though, I *tried* to keep a “reporter” mindset and was just trying to gather as much information as I could. However, I did get to a point (near the Babel stuff) where I was just way too overloaded with aburdities and just passed by some of the wall plaques. My last bit of suffering (coincidentally) came with the Jesus story video called “The Last Adam.” I had to struggle to refrain from snorting laughter and “HA!” outbursts. Thanks for doing this Dan. That was very informative – much more than the museum itelf by the looks of things! It certainly made me laugh and I believe sometime humour is the only antidote to dumbness of the scale of this museum. On a serious note however, I gotta say that I have noticed quite a bit of money flowing into these sorts of endeavors lately. I live a few miles away from the TBN studios in Costa Mesa California. I encourage everyone who reads this to take a look at this compound via the web. It’s amazing the kind of wealth this place flaunts. Creationism is dead……….it just doesn’t know it yet. Ah.. uh.. 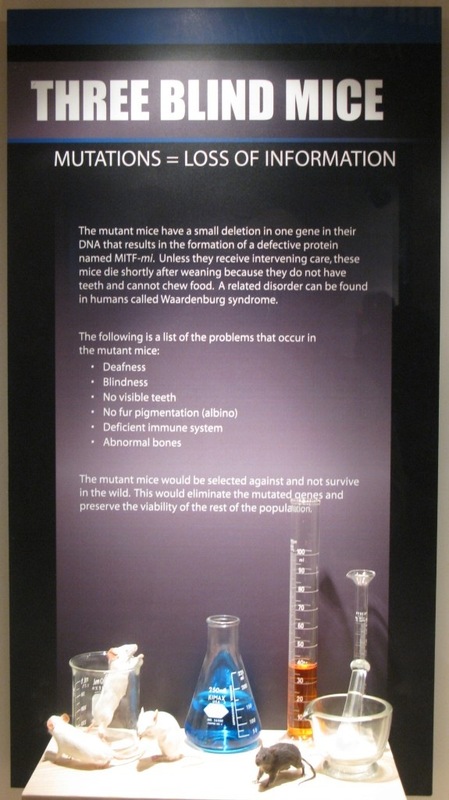 I think I just had an aneurysm from the pure stupidity of this “museum”…. 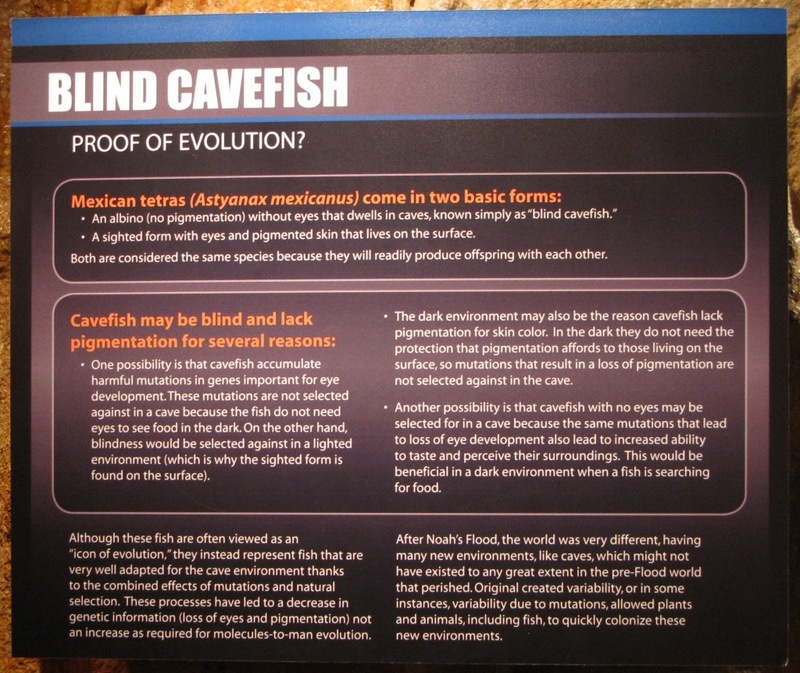 It’s funny, and rather telling, that creationists seem to understand evolutionist arguments better than they do. But it is also exceedingly obvious that you do not even try to understand our arguments, as you would rather ridicule the argument than truly grasp the content of it. 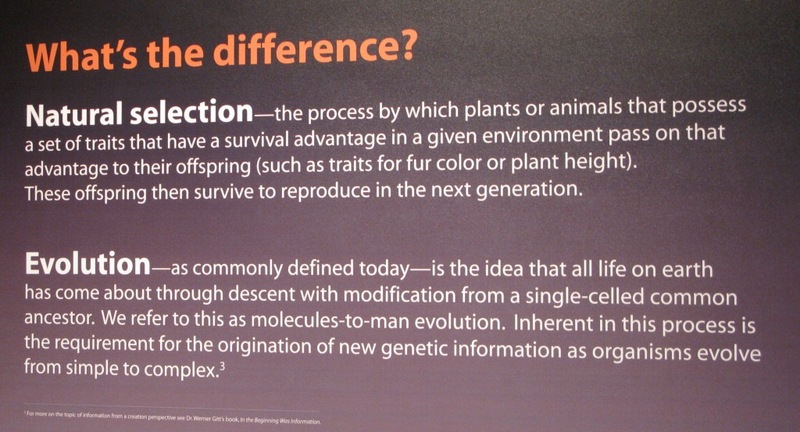 As a simple passing example, you site that the canine exhibit claims that speciation does not occur, and then agrees that it does…obviously you blatantly ignore the term “kinds” in reference to this argument, and hope that your readers will simply ignore this (or they will not read the plaque at all). The argument clearly posited that no “kind” has been shown to magically morph into another “kind” via speciation. The reference to the “man-made term” is relevant because it is differentiating the aforementioned “kinds” which is a biblical term with the generalized term “species” (created by man), which has proven to be a tricky definition to narrow down due to ambiguity of what exactly constitutes a species from organism to organism. You then use that as a straw man argument to infer that we do not believe that speciation occurs, which we clearly do (as any reputable creationist site will show). Next you criticize the second sign for being disingenuous with no merit at all, by citing the fact that wolves and foxes are separate species (one which we would not contest), and that they are in fact of the same kind, or family class (which is precisely what is stated on the plaque). Your arguments run in circles and are not based on a logical dissection of our valid arguments as stated. The only thing this article has proven to me, is that you do not in fact comprehend creationist arguments. Either that, or you do comprehend them, and are being disingenuous at best. Please stop setting up straw man arguments. I know they are easier to knock down, but they do not present a genuine, intellectual argument, and only help to further illuminate the shaky foundations that evolution is built upon. 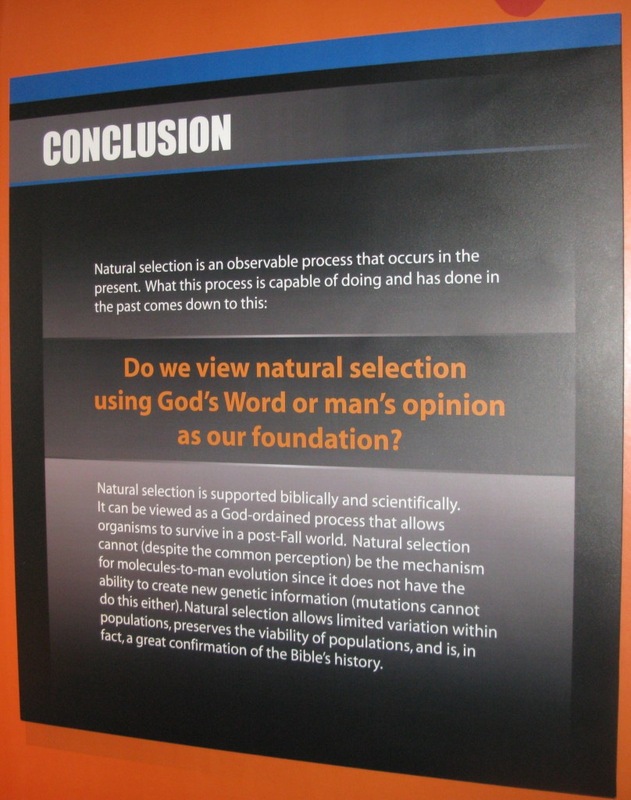 To say that creationists understand “evolutionist arguments” is generally, I think, a bit of an overstatement. I’m sure there are instances of creationists understanding the evidence for evolution, but they are few and far between. Creationist arguments, on the other hand, are generally easy to understand and those who are moderately to highly versed in evolutionary theory easily understand them and easily point out their invalidity. 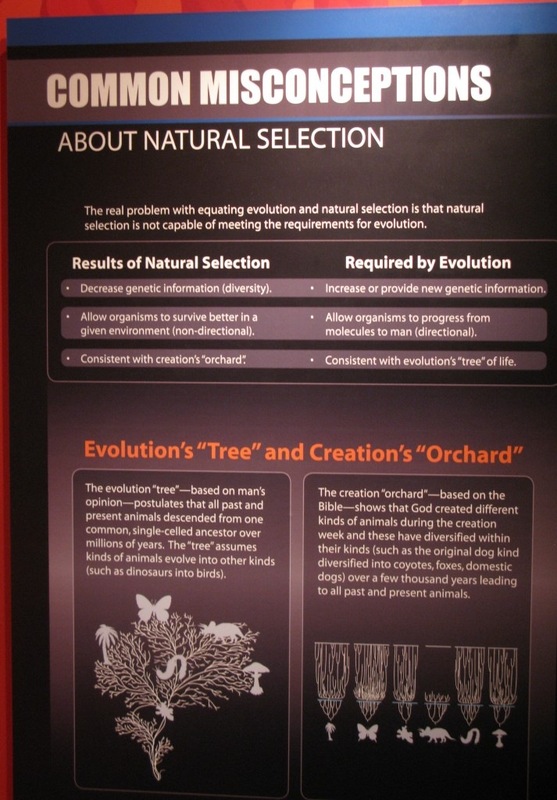 As for the Creation Museum’s “Natural Selection is Not Evolution” exhibit, I don’t think I ridiculed it. I refuted it. 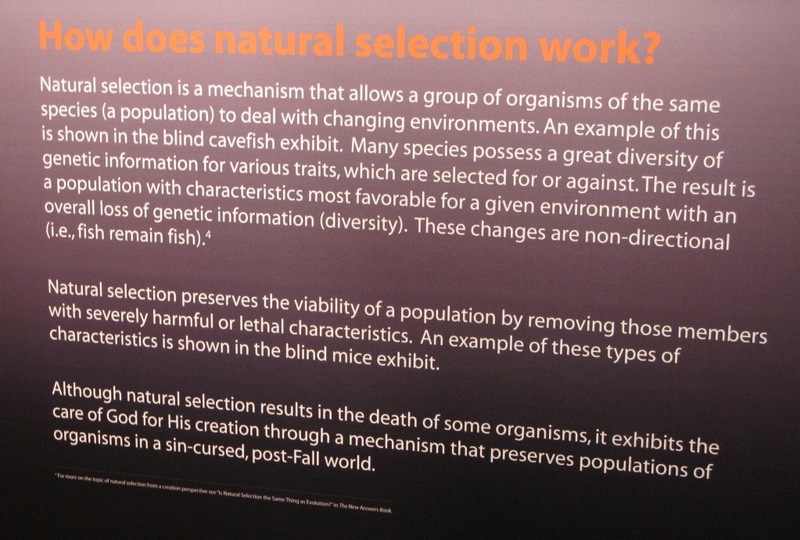 Your point is taken, I agree, that the first sign about “speciation” and “kinds” does say that speciation occurs. I was in error in saying that the sign says it doesn’t. However, the term is misrepresented and, evidently, misunderstood. The word “kind” is used in a way that insinuates it is more specific… or more scientific… when in fact, it is egregiously vague to the point of being meaningless… or to the point where the meaning is easily changed to suit the argument of the moment (as you so nicely demonstrated in your reference to wolves and foxes). It has no validity in evolutionary science. You seem to imply that “kinds” is a biblical term and, therefore, not man-made… or somehow more precise. I find that position untenable. 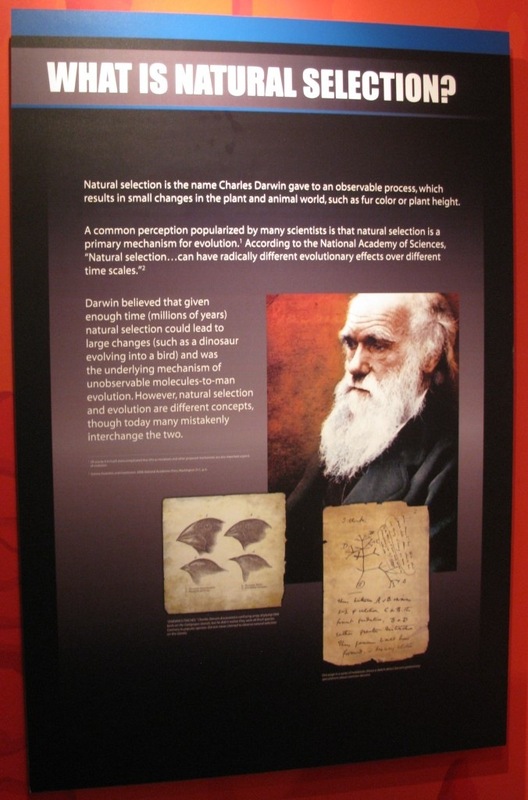 The sign says that speciation occurs, but before that, claims that “speciation has never resulted in one kind of organism evolving into another kind, such as a reptile evolving into a bird.” That statement is blatantly false unless you change the meaning of the word “speciation” or ignore all contradictory evidence. Claiming that “species” is a man-made term is, indeed, an attempt to marginalize the word and my point stands that every word is man-made… including words in the bible. So, in fact, my arguments do stand and I have neither misunderstood nor been disingenuous regarding creationist arguments… nor did I set up a straw man argument. Your comment is a good example of the distortion and cherry-picking of evidence that I mention in this post… misleading use (or misunderstanding) of the word “speciation,” using the ambiguous word “kinds” as if it had scientific value, ignoring contradictory evidence, and ignoring the refutations in the rest of my post. I don’t think my arguments have an effect on the “foundations that evolution is built upon.” Those foundations are well beyond solid with our without my help. What part of your argument do you think I do not understand? I understand that the ambiguous nature of the word “evolution” can mean literally anything you want it to; that’s what I understand. For example, you could say: We have seen the “evolution” of little Jimmy as a soccer player since last year. In this instance you are talking simply about the fact that things (or people), by their very nature, change as time progresses. This is a very generalized use of the word, but is encompassed by the definition nevertheless. Or you could say that life came about via “evolution” over billions of years from a single-celled organism (which magically appeared out of goo), through selective mutation and natural selection, whereby billions of units of information were added to the genome successively for no apparent reason, and symbiotic and irreducibly complex organism structures were pieced together by chance processes to arrive at highly intelligent, multi-trillion celled organisms known as human beings, without any purpose or meaning whatsoever. An equivalent argument would be something like: scientists have “designed” extremely complex and intricate computer chips using nanotechnology, and these scientists are very “intelligent”; therefore, this proves “Intelligent Design” by supernatural creation 6,000 years ago. Following your logic of equivocation, one could pretty much argue whatever he or she wanted without committing any logical fallacies. Now, evolution presupposes nothing, because by its nature it is random, and it has no specified goal or cause in which to guide it. Therefore, a measure of ordered complexity (in some cases irreducible complexity) can be used in conjunction with probability theory, to arrive at a hypothetical limit for the probability of random occurrences producing known, complex entities. This is purely logical, because we can recreate the method using actual science. This can then be used to determine the validity of any chance process arriving at a given outcome, considering all necessary variables, and the quantitative, known outcomes involved. For instance, if we were to roll two gaming die, we can conclude the probability of arriving at a known outcome of 12 in a single roll, using the numbered pairs on the die of 1-6. Knowing this, we could extrapolate how many rolls it would take, and what the probability would be, of getting virtually any combination of numbers. Now taking this a step further, we can quantify what the probability is of chance processes (evolution) producing the most basic components necessary for life. Let’s take a look at just a few of these components, and then we will determine the probability of their spontaneous arrival. The variables involved here require several consecutive improbable occurrences just to form the molecule chains in amino acids, but for the sake of argument, we will assume the amino acid as a given. Amino acids are necessary for the building of proteins, which are essential in cell function, and ultimately for biological function. There are over 2,000 different varieties of amino acids, but only 20 of these are the type used in biological systems. These select amino acids also must be chained together in a specified order to produce a viable protein. Amino acids come in two equal but opposite flavors, left-handed and right-handed versions. Naturally occurring versions are racemic in nature, which means that they are automatically inclined to split into equal portions of left and right-handed (chiral, or mirror imaged) amino acids. The proteins necessary for life, however, are strictly made up of left-handed amino acids; a single right-hander would render an otherwise functional protein useless. Furthermore, one must consider the fact that these amino acids would be destroyed by oxygen just as soon as they (supposedly) assembled themselves. Even if you assume (incorrectly) that the early atmosphere did not contain oxygen, this would prevent the formation of ozone (O^3) which blocks ultraviolet radiation, which also would destroy these molecules. The notion that they somehow formed deep within the ocean also will not save you, due to the fact that hydrolysis would destroy amino acid chains by causing them to break apart. Let’s continue on to proteins. Assuming that evolution somehow overcame the odds and formed all 20 amino acids necessary for life, separated them from the 2,000 or so variations available, found a way to separate the chiral pairs, and overcame the environmental factors that would destroy them as soon as they formed, it (evolution) would still have to figure out how to put those 20 amino acids in specified (not random) order to form the most basic protein imaginable, with 100 amino acids (average protein size is about 300 amino acids). Proteins also come in many different varieties, due to the fact that they have several different functions. This means that each amino acid chain of 100-300 units, would have to be ordered exactly right just to make a single viable protein; but this is only one protein out of literally thousands of uniquely functioning versions required for a cell to operate. So what is the probability of these unlikely events occurring by chance processes? Well, let’s consider the amino acids necessary for a simple protein as described above, with 100 units. Assuming we have the correct molecules for life (out of the 2,000), what is the probability of getting 100 consecutive left handed versions in order to form a protein? If we were to compare this to flipping a coin (representing a 50/50 chance), in order to get heads 100 times in a row, we would have to flip the coin 10^30 times (that’s 1 followed by 30 zeros)! In fact, the probability of an average size protein forming by chance is calculated to be roughly 4.9 x 10^-191. The laws of probability imply that any event that has less than 1 chance in 10^50 of occurring, is for all practical purposes, impossible. Sir Frederick Hoyle calculated the probability of the most basic building block of life, a cell, arising by chance, to be 1 x 10^-40,000. This number is so unimaginable, that is impossible (for all probability purposes) almost a thousand times over. Now two things must be pointed out at this stage: 1) these are just some of the many complex biological structures and machines that are necessary and observable in life; and 2) the calculations listed for probability in the previous paragraph are for quantitative, known outcomes, as I mentioned earlier on. Because evolution began working with nothing and with no goal in mind (no pun intended), the desired outcomes were nonexistent. The contention that evolution built upon working structural benchmarks of biological precursors is absurd, due to the fact that preconditions were not set which specify a desired outcome. Therefore, the probability argument cannot even destroy your argument, prior to its destruction by logic alone. After all, it’s not as if all of the components necessary for life were created by evolution, set in a pile, and selected at random to try and form viable molecular structures. Even if that was the case (which would imply motive, and therefore intelligence for evolution), the argument would still be defeated by probability theory anyways. The conclusion is that you must believe by faith that all of this happened, using just-so stories to qualify the irrationality of evolutionary biological origins. This is then presupposed as a foundation for your worldview, which determines how you interpret the evidence. So really it doesn’t matter what evidence there is, because we all have the same evidence, we simply interpret it based on what our worldviews are. Therefore, everything we argue to this point, will be nothing but mere semantics, because your beliefs determine your bias, just the same as mine do. Wow. That was an exceptionally long (and inaccurate) response, but ultimately pointless. Despite your use of sciencey words and baseless probability speculations, you really continue to show a complete lack of understanding of the process of evolution, and in this case, evolution has a very specific meaning. 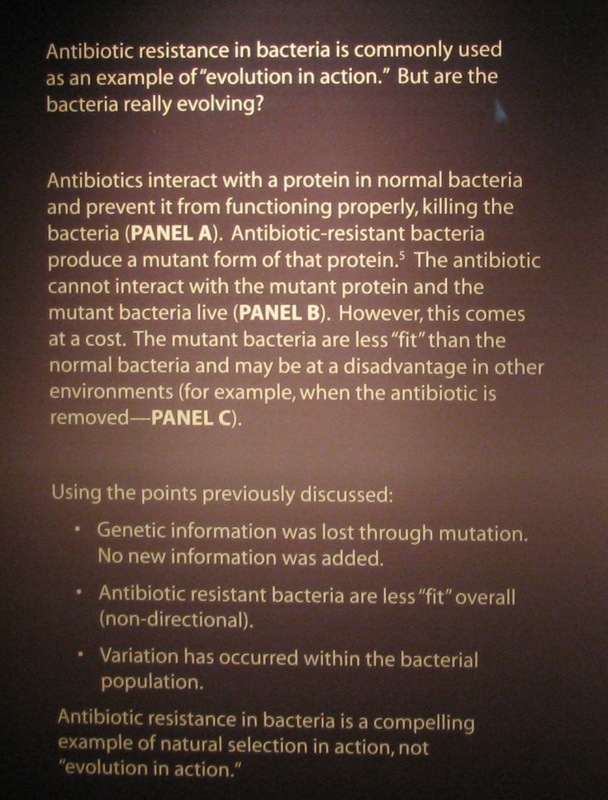 Your description of evolution, however, is what really displays your lack of understanding. Using words like “magically” and “selective mutation” and “irreducibly complex” is a glaring indication of that. Calling evolution a “random” process is also incorrect. It’s almost as if you cut and pasted some text from the Discovery Institute or from Answers in Genesis. The one thing you did get right, however, is the idea that evolution has no purpose. Your diatribe about gaming probabilities, amino acids, and proteins is also irrelevant to the discussion (not to mention fallacious… Hoyle’s Fallacy? Please.) and it baffles me why you felt the need to present it. Reading that makes me even more suspicious of cut and paste activity. In the end, your “conclusion” is incorrect. There is no faith involved in my position… or anyone’s position who accepts evolutionary theory. Faith is belief without evidence or proof. Evolutionary theory has mountains of evidence to back it up. It requires not a single ounce of faith. Next time you comment, it would be great if you provided your own thoughts in a more concise (and relevant) manner. I did not address each of your individual points because a little research online (at reputable science sites) will give you more information than you’ll ever need… and I’m not going to do your work for you. Understand Creationist arguments? Like what? Lies and religious propaganda? Selective science? Appeals to magic to support a cause? Please do be more specific. What lies are you referring to exactly? If by selective science you mean science which we can observe and recreate, such that it comports with the principles of the scientific method, then yes, we are very selective. You might want to consider how the word “magic” applies to unseen forces which are made up to “support a cause” such as dark matter, dark energy, inflation, mysterious Oort Clouds, and the infamous Big Bang, which both violates and creates the known laws of physics simultaneously. People have been indoctrinated by evolution since the 1970’s. People have been indoctrinated by religion for centuries. Indoctrination has no place for a thinking person. Anyone with a brain will think, research and look for the truth for themselves. I thank God i have not been indoctrinated by McDonalds to eat hamburgers. I don’t go to a theme park or a zoo and feel like I have been brainwashed so what is wrong with having a museum with a different viewpoint? I get so angry that evolution is taught as a fact just as I would be angry if people taught a flat earth as fact. There is no more proof for macro evolution than there is for Santa Claus, fairies and elves, be honest, admit it. Evolution is just as much of a faith as creationism is and I’d rather be a sad old git with the power of God behind me than a sad, old git fighting for survival and waiting to become a pile of dust! I hope we will learn as we grow. Maybe the answer is to begin again like that man who set out to disprove the resurrection and ended up becoming a believer! Indoctrination. It appears that you misunderstand its meaning. If you mean the teaching of children from birth that certain unsupportable mythologies are factually true and that their every action must be based on these mythologies or they will be eternally punished in a lake of fire… then I’ll agree with you. If, however, you mean teaching children from school age that there is an overwhelming abundance of certain observable facts from multiple fields of study in our natural world that indicate that all life is related from a common ancestor… then you’re off your rocker. As I said before, I’m not going to list the evidence here. It has filled plenty of books that are readily available, so anyone with some intellectual honesty can easily do some simple research to get it. You obviously have not done that, as your assertions repeatedly have demonstrated. Accepting the theory of evolution is not a matter of faith. Far from it. Faith is an unwavering belief in something without any supporting evidence. Acceptance of evolution is the exact opposite of that… as is acceptance of gravity… or physics… or any other scientific theory. The evidence, to this point, is 100% in support of evolution, but if that somehow changes (Gould’s rabbits in the pre-cambrian), then I dare say that every single evolutionary scientist on the planet will follow the new evidence to its logical conclusion. “Faith” has nothing to do with it. So you go on believing what you believe. Keep having “faith” in your positions. Go on to become a “sad old git with the power of God” behind you. As for myself, I’d much rather live in a reality-based world. So this means that “John” won’t bother to research it. Everything he’s written has indicated that he doesn’t know what science is nor how to use it… and his claims to be open minded and willing to change are nonesense. He is clearly not “intellectually honest”. Sad but true, Joe. Sad but true.